Here are some quick guidelines and agendas that you can use to re-enforce the Scrum meetings so they are fast, efficient and focused. I use these myself, in meeting invites and emails, to keep teams focused. It's especially helpful with teams that are new to Scrum and still learning. I've formatted these guidelines and agendas in plain text without any rich formatting, so that you can easily reuse them by copying and pasting them directly into emails and meeting invites. Because different apps will handle rich text formatting differently, or sometimes not at all, this plain text allows you to use them immediately without having to deal with fixing or re-doing the rich text formatting. 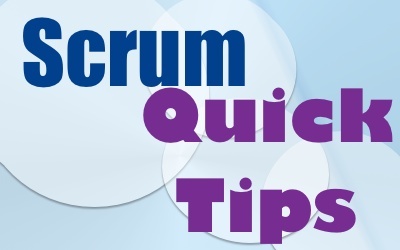 This blog post is only intended to be a quick reference for someone already trained and skilled in Scrum. These come directly from the official Scrum training, they are not a substitute for formal Scrum training. For all the details on the process, every team member should read this book from Mark Layton called Agile Project Management For Dummies - see my review here. - Time boxed at no more than 2 hours long. - Part 1: Set sprint goal & choose stories. > Review the Product Backlog & set a sprint goal. > Select stories from the Product Backlog. > Review story point estimates and adjust if needed. - Part 2: Break down stories into tasks. > Break each story down in to tasks. > Estimate the hours required to complete each task. - Review your Sprint Backlog and confirm the team can complete it. Adjust as needed. Use the Estimating, Ranking & Planning Poker as needed to refine the Sprint. - Time boxed to 15 minutes. > What did I do yesterday ? > What I can do today ? > What are my blockers ? - For coordination, not for solving problems. - Time boxed at no more than 1 hour long. - Review what is Done. Scrum team presents what it accomplished during the Sprint. Use the Sprint Backlog as your guide. - Typically takes the form of a demo of new features or underlying architecture. > 2-hour prep time limit. > No rigged or staged demos. - Whole Scrum team participates. - Review what's done, using Sprint Backlog. - Review what is not done and put into the next Sprint. - Demo what is done. - Time boxed at no more than 45 minutes for every week of the Sprint. > What went well ? > What would we like to change ? > How can we implement that change ? Everyone should be prepared to give at least 1 answer of their own, to all 3 questions. "I don't know" or "I don't have an opinion", is not an option :-) You can provide more than 1 if you have more ideas. - Answers are Action focused (WHAT to do). - Sprint Retrospective is done after every single Sprint. > If the team desires, possibly customers and others. - Alternate the order that people go. So that it's not the same person going first, alternate the order that people present. For example go alphabetical by first name on even numbered days, last name on odd numbered days, and switch it up by going in ascending order one meeting, and descending another. - Record the answers in a shared document, stored in a team wiki for example. - Create tasks for the next Sprint to implement Actions. Organizations need to be assured the individuals that manage their projects can integrate methods to achieve sustainability goals and still achieve project specific objectives. Project Managers need credentials that validate their proficiency with these specialized qualities. PMP Certified and scrum certified project managers can learn, apply, and validate mastery of sustainability based project methods to meet these demands.